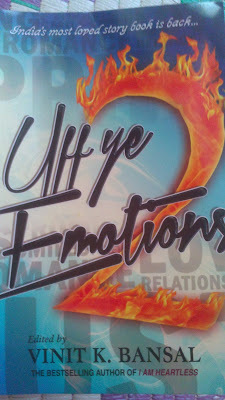 I received a copy of recently published book, Uff Ye Emotions 2. It is the second book in Uff Ye Emotions series, which is basically a collection of stories, mostly surrounding love and emotions. I had published a review of this book earlier and people told me that I almost revealed the story… Reviewing a short story collection is a bit of a challenge compared to a novel. Each short story is unique, has its own characters, theme and style. There’re not many common elements to talk about. The stories last only few pages and writing about it in an abridged way, without revealing core content or idea behind the story is a challenge. Write too little and reader won’t get a clue why they should read this story. Write too much and they won’t have a reason to pay and buy the book again. A reviewer needs to balance between the two. I’ve re-written the review now. 'Uff Ye Imotions 2' has 11 short stories, each one equally interesting. The stories are written by different writers, including Vinit K Bansal, Kunal Marathe and others. The second story, "Moksha" is pictured around a loving husband's act against his wife. Some decisions in life are never easy to take, because there's trouble if you do, there's more pain if you don't. This story is written by Kunal Marathe. 3rd story, "When Destiny strikes" is about being able to spot your best buddy, even after decades of separation and among a huge crowd. Written by Mahi Singla, this story can make us recall our own childhood friends and memories. 4th story, "The woman who waited" is another catch 20 situation. What is the right time and right way to tell the truth to your loved ones? Is it easier to tell the truth and hurt everyone badly, or hold the truth, appear as villain and hope it causes less pain? What is easier for the other person to overcome? Bitter truth or false betrayal? Read this story to find out. It is written by Shalini Katyal. The next one, "The pale pigeon" is a story many senior citizens may feel their own. Sidhartha Yadav takes us through the experience of a senior couple, who did everything possible for their son. Were they taken good care of? Were their decisions right? 6th one, Hickey, by Heema Shirvaikar, is about domestic violence. The story is told from a young girl's perspective, who observes things no one wants to accept or explain. Why do many women chose to stay mum despite physical torture? Is there a way out? What can be done if you happen to be a spectator to such brutality? Must read story. 7th one, NCERT of love, uses real names of its authors (Himanshu Chabra and Udita Pal) for lead characters. It is about a roof top incident going out of control. Read for some interesting exchanges of love letters. FYI- NCERT is the publisher of textbooks for most of CBSE schools. 8th one, "I'll be there" is written by Ishani Malhotra. You go out on a vacation to a remote place, hoping to escape from all the worries in life and the supposed to be solo and calm vacation ends up being a romantic escapade, not knowing real identities of each other. Will it end in a disaster or ends on happy note? 9th story in "Uff Yeh Emotions 2" is again about the dilemma of having to take tough decisions- supporting someone vs supporting self. What will you do in such situation? Whom will you sacrifice? All in all the stories are not only entertaining but raise lots of questions about things we do in life and situations we face. Are we doing right things? How do we prioritize? Why wouldn't other person understand our view point? What is the right way to convey a message?